Our counters are crock free for the first time since August. And, although we could have left this last batch to ferment and do its’ thing for a few more weeks we decided it was time to switch gears and start getting things sorted for our departure. In two weeks, we will be heading south to the sunny state of Florida where we will visit my mom and continue the canning craze with all of that citrus. 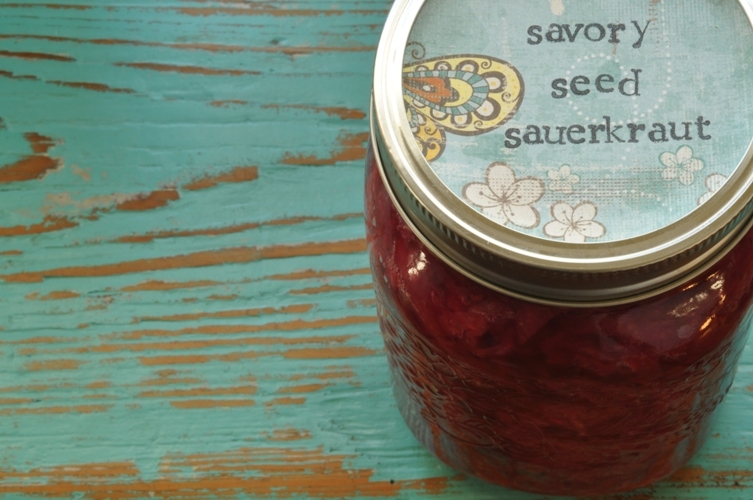 The savory seed sauerkraut was the last crock standing and it now resides happily in 6 ~ 1 litre jars. At first, I wasn’t completely crazy about this kraut. It isn’t as crunchy as the traditional plain salted cabbage/sauerkraut that we normally have brewing and it took a lot longer for it to start doing its thing. 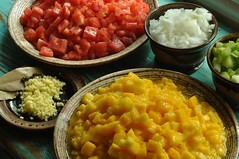 The bubbling and bloom that developes indicates that it is fermenting and turning into a tasty, tangy concoction. But, this batch sat covered in bloomless brine for about 3 1/2 weeks. Then, the bloom began and the tangy taste started to develop and convert this green and purple cabbage into a piquant coloured kraut. In a way it’s sad to see the counters crock free but I guarantee when we return from the south, the process of fermentation ~ experimentation will start right back up again! I’m anxious to try fermenting rutabaga and make a lighter purple ~ more pink sauerkraut with just caraway seeds. Where do you find your wonderful labels? Do you have a template and then use rubber stamps for the words. Can’t wait to see what you do with all the citrus! Interesting kraut mix. In our little abode, my husband does all the kraut prep and monitoring so I will definitely be sharing your post with him. I believe he is currently fermenting a mix of celery root with diakon radish and another batch of purple cabbage with beets. It certainly makes for some interesting dinner time sampling and conversation! Ditto on the label question…..any templates or sites you can share? Safe travels on your trip to Florida and the sunshine-soak it up! Thanks guys. I’m working on a post about our labelling making…it will be up this week. It is really easy and lots of fun!